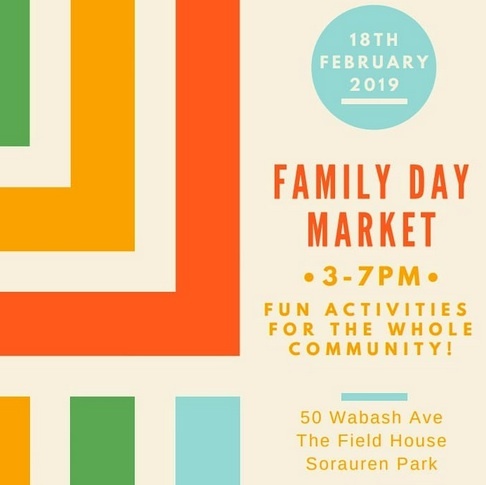 Come to Sorauren Park on Family Day, Monday February 19, for a special Farmers Market , 3 – 7 p.m. The pizza oven will be fired up, there will be free hot cider, and delicious hot chocolate will be sold from an outdoor booth. If the weather cooperates, the natural ice rink will be open for pleasure skating and shinny. Plus, all the winter Market vendors will be open in the Fieldhouse. 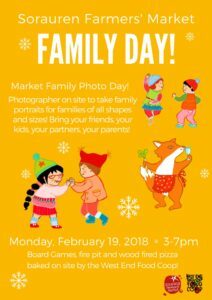 The Market will also be offering a family portrait service and board games. See you at the park! Support Sorauren Park this holiday season by shopping at our supporters! 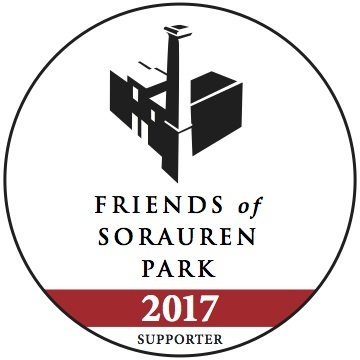 Look for the new Friends of Sorauren Park decal in the shop windows of the retailers and organizations that support the park. Free programming at the park, including outdoor movies, the natural ice rink and festivals such as the WaBASH Fall Festival, cost money to produce. In addition to your donations, funding from our sponsors helps pay for permits, staging, licences, equipment and supplies. Visit the Sorauren Farmers Market throughout the winter every Monday 3 – 7 p.m. in the Fieldhouse. A special Craft Market on Monday Dec. 11 is perfectly timed for the holidays. 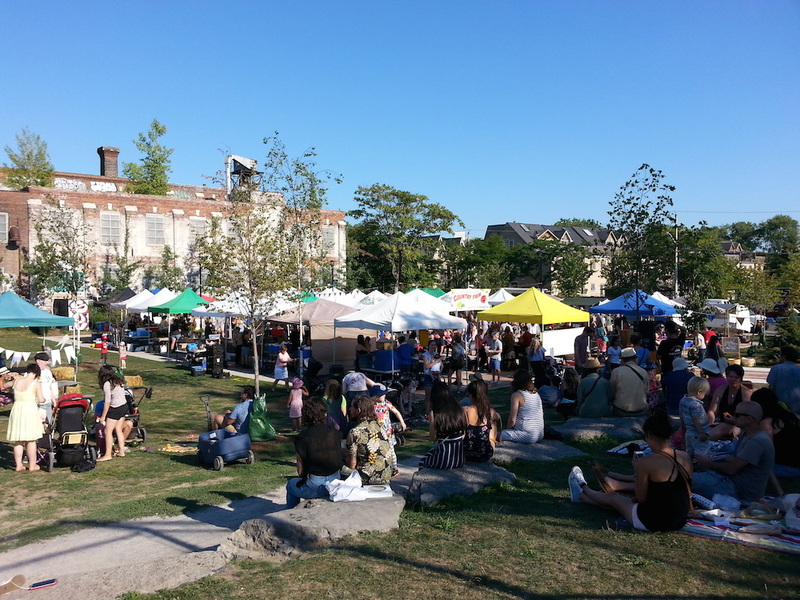 Special thanks also to park supporter Roncesvalles Village BIA. Shop local to keep our community’s economic ecosystem healthy. It’s the perfect finish to your long Canada Day weekend. 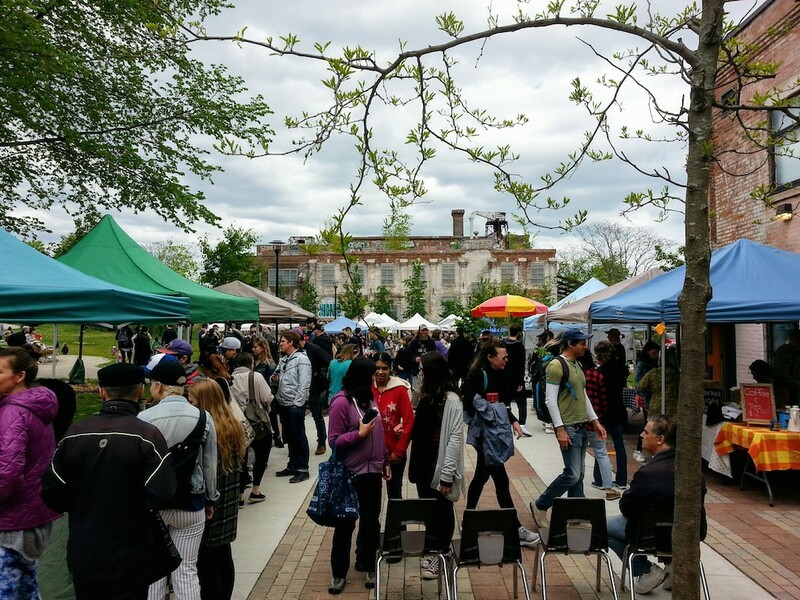 Come to the Sorauren Farmers Market on Monday, July 3 from 3 – 7 p.m. on the Sorauren Town Square. Enjoy fresh Ontario produce, delicious prepared food, meats, baked goods and yummy sweets. The Farmer’s Market is brought to you every Monday, year-round, by the staff and volunteers of the West End Food Co-op. And the farmers.